Elizabeth posted on LinkedIn that she was “tracing the slaves…brought to MN. She further explained: I’m trying to find where they came from prior to coming to MN and what happened to them after they left. A subsequent post gave us a bit more information: I'm investigating the slaves that were brought to the St. Cloud area in the 1850's and 1860's trying to find documentation of their lives before and after St. Cloud, MN. Having an interest in upper northern slaves and slave-owners, I thought I’d offer a few main tips. As early as 1826 slaves were recorded in Minnesota, mostly around Ft. Snelling and frequently related to the fur-trade. Officers brought their slaves and often bound them to neighboring officers to complete special chores: fur industry and household chores. It is stated in Minnesota history, that few slaves were bought and sold. 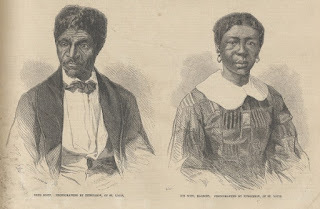 Major Lawrence Taliaferro, an Indian Agent, was both a large slave-owner and he “rented” slaves prior to emancipating his lot that valued “between twenty-five and thirty thousand dollars.” The most famous of his slaves was Harriet Robinson who married Dred Scott at Ft. Snelling. Dred Scott’s master, Dr. John Emerson, was the Ft. Snelling medical officer. Emerson later acquired Harriet Robinson also. Analyze Census Records. Not all African Americans were slaves. 1849 Minnesota Territorial Census there were 40 free-African, mostly from seven families residing in St. Paul. In 1863 over 500 free colored arrived by steamboat from St Louis to St. Paul (May 1863). The Missouri Compromise and Northwest Ordinance, that prohibited slavery, were ignored especially after the Dred Scott decision in 1857. The Dred Scott case protected the slave owners even in non-slave states. Due to the Dred Scott decision, researchers tracing a slave’s life must also follow the master’s path. St Cloud was an ideal vacationing spot for wealthy slave owners from the deep south or neighboring territories, like Missouri. It was common for these vacationers to carry along their slaves. In St. Cloud, there are a few famous stories but mostly told through the life of the Lowry family. Slaves are documented in St. Cloud as early as 1854. Contrary to the fact that Minnesota was considered an anti-abolitionist state, abolitionists still assisted slaves in running away to Canada. Many free-coloreds, also settled in nearby Canada (Blegen, pg. 237). Notices of fugitive slaves were often placed in newspapers and in accounts of abolitionists after the war. African Americans were often promised freedom or fought for freedom during the Civil War. In Minnesota, Ft. Snelling more than 100 black soldiers volunteered for the USCT. Provost Marshall Records; NARA RG 110, be sure to check MO. Research should be conducted for USCT 18th, and USCT 68th regiments records holdings. Kathleen, thank you for your comments. You have so many records at your fingertips, and this is such comprehensive advice. I had not thought of the Genealogical Collections of the DAR, at FamilySearch, for example. I'm glad you are there to advise us. Thanks Katleen for this great information. I will surely try to check some of this records to help me with my research. Once again great post. What a wonderful list of very helpful tips and resources, Kathleen. I'm sure these ideas - and problem-solving ideas - will help many others. Methodically looking at history, analyzing possibilities of paper trails/clues... so helpful. Thanks again.